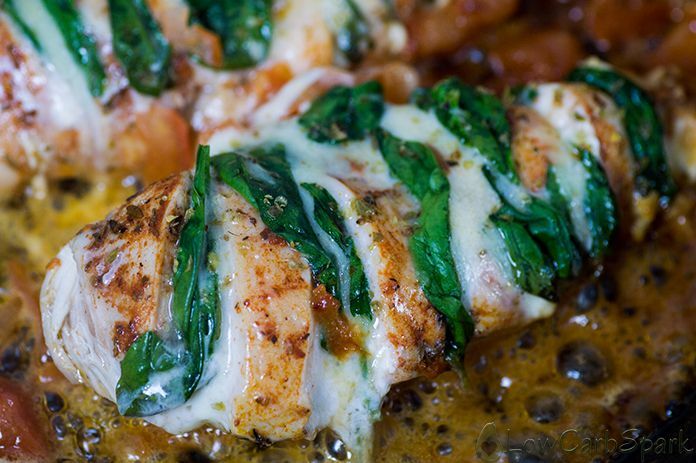 The Hasselback Chicken Stuffed with Mozzarella and Spinach is tender, juicy cheesy, healthy and became our favourite instantly. You will love it too because what’s not to love? When chicken meets cheese and spices. You can definitely add some bacon and you will get an explosion of flavour with every bite. 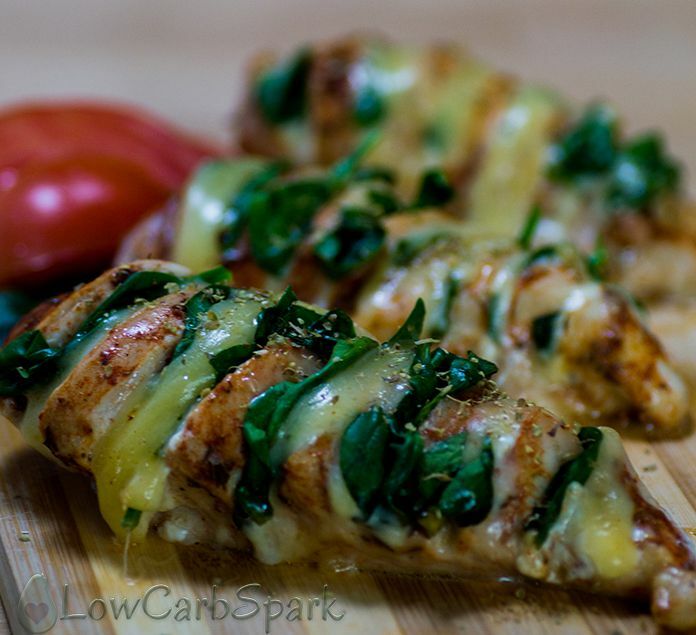 Hasselback Chicken is a keto staple recipe for me right now especially since I travel a lot and don’t have many kitchen appliances to cook elaborated recipes. 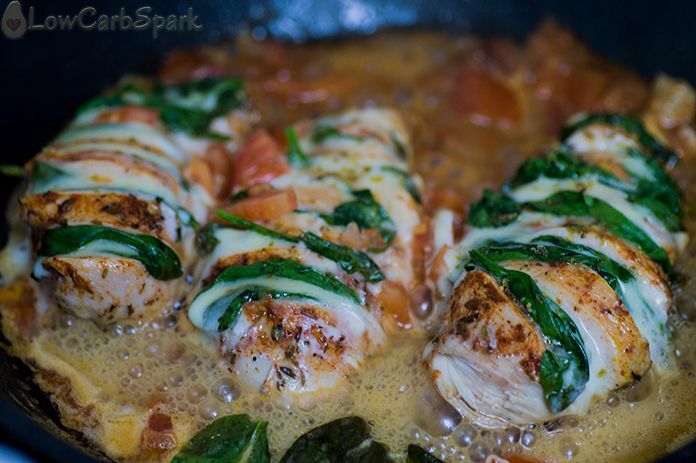 I cooked it in a skillet on the stove, but in the recipe below, you have the instructions on how to bake the chicken breasts. Let me tell you: this recipe is amazingly easy to make even though it looks like a lot of work. I actually made this recipe for our special Valentine’s Day Keto Dinner and we both loved every bite so much and decided to share it with you. 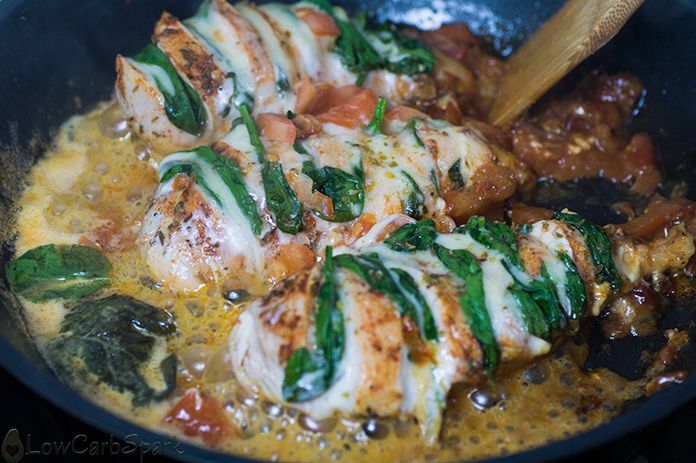 Add one medium tomato while the breasts are cooking and serve the sauce over the cooked chicken. 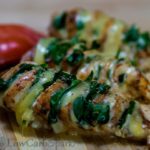 Hasselback Chicken Stuffed with Mozzarella and Spinach is a keto and super low carb recipe that you will definitely love. It's moist, cheesy, full of flavours and also very healthy. It will take you less than 10 minutes to prepare it and the result is a meal loved by all family members. 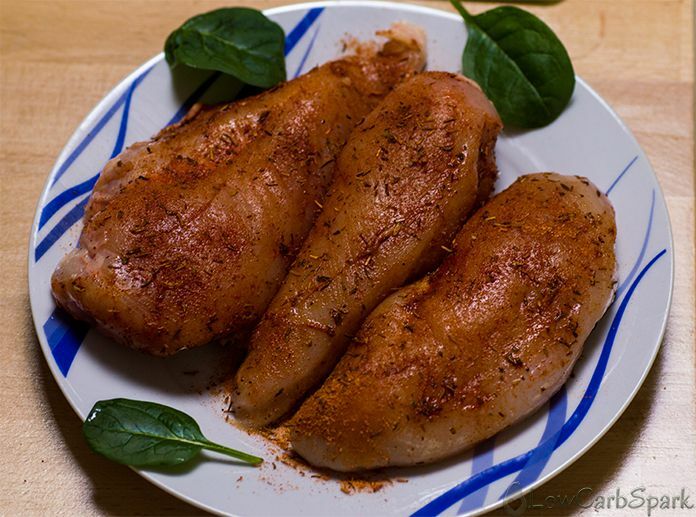 Sprinkle the chicken breast with your favourite chicken blend spice. Using a sharp knife, cut 6-7 crosswise slits every half-inch along the chicken breast without cutting all the way to the bottom. 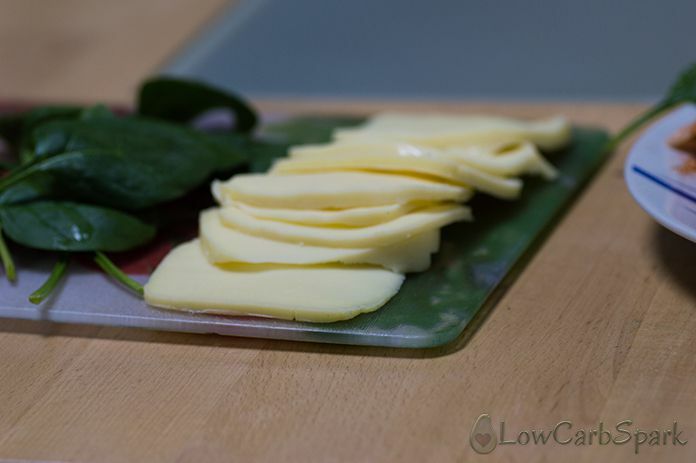 Fill the cuts with both spinach and mozzarella. Transfer the chicken into a frying pan. Add a cup of water and the chopped tomato and let it simmer for 20-25 minutes until the chicken is cooked through and is no longer pink. The Oven Version: Preheat the oven to 350 F. Bake for 25-30 minutes. Serve with a green salad or with zucchini noodles. The recipe asks for mozzarella cheese, but you can definitely use any cheese you love and have on hand. Substitute the spinach with tomato, bell pepper, zucchini, mushrooms or red onions. 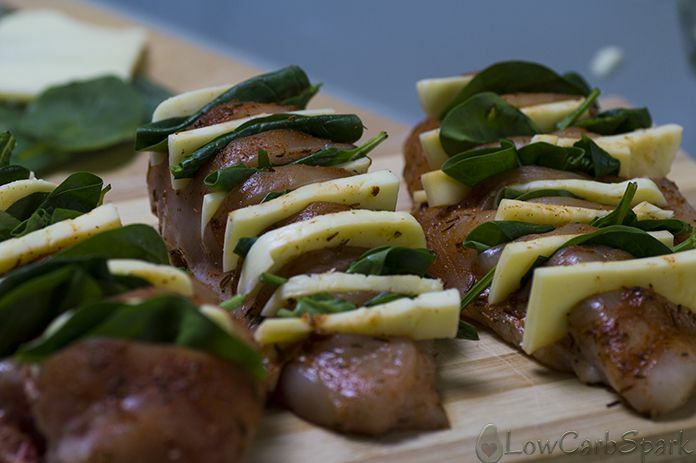 They all are the perfect combo for mozzarella and chicken. 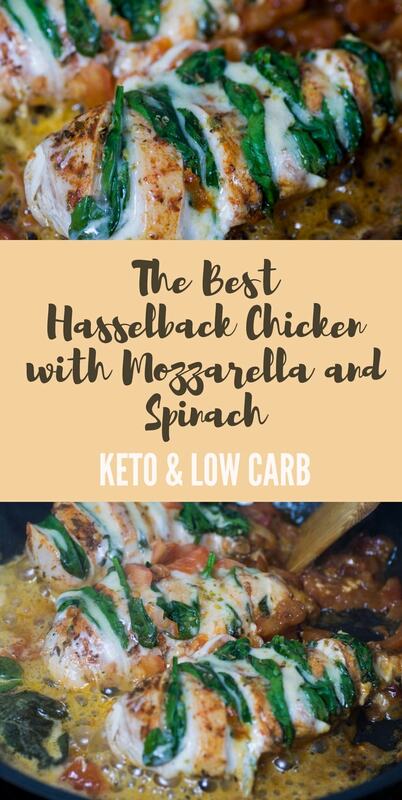 PS: If you are new to the keto diet or want expert guidance, keto meal plans, and the best keto recipes, check out my Keto for Accelerated Fat Loss Program that has all the tools you need to reach your goals. This looks scrumptious Ioana. I'm lazy, though. I'm going to try this with a rotisserie whole chicken; separate the legs and back from the breast and wings, make the recipe using the breast, and eat the legs the next day for supper. Yum! Maybe not quite as nice as using my own spice mixture as you do, but the rotisserie skin adds wonderful flavor and ketogenic fat. Sounds so delicious! Let me know how it turns out!! I love the chicken skin so much. It's crispy and spicy!